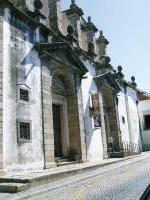 The Historic Centre of Evora is exemplary for the Golden Age of Portugal, and strongly influenced Portuguese architecture in Brazil. 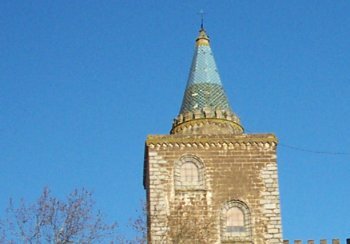 Although some buildings of the medieval period - such as the Cathedral - remain, the historic town evolved from the 15th century. 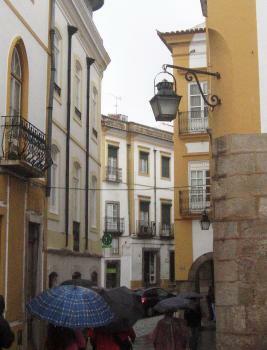 Evora became the seat of the Portuguese royals, an archbishopry and a university town. Many new churches, convents and palaces were built. Its cityscape is dominated by the many low whitewashed houses and narrow streets. The town also holds a Roman Temple, believed to have been constructed around the first century A.D. This must be the largest disappointment of my Portugal trip. The town's beauty is sung by many guidebooks, and it has become very touristy. Even around Christmas quite a number of tourists occupied the streets of this Spanish-looking town. The historic centre is confined within city walls, but unfortunately cars (and buses) are allowed there too. Évora has received some mixed reviews on this site, and, although I had a pleasant visit (admittedly a quite short one), I also thought the town was a bit overrated (maybe the hordes of tourists prove me wrong). The main sight, the cathedral, is really massive on the outside and beautifully decorated on the inside. The Roman temple (generally named the Temple of Diana, but it's not really clear to whom it was dedicated) just a few steps away is nice, but nothing really special. Évora has some other historic attractions (mainly the Church of Sao Francisco with the Bones Chapel - unfortunately already closed when I went there) and is really nice for wandering around, but I felt that the WH status was only justified for the cathedral, not the entire town. 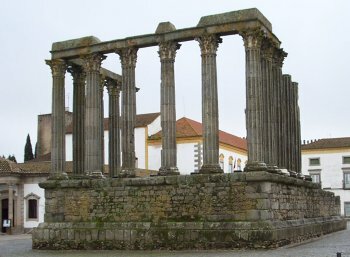 I'm not sure I saw Évora at its best, since I visited on a cool, rainy autumn day in 2012, but I was impressed with the Roman monuments and Portuguese architecture I saw throughout the city. I joined a walking tour of the city, which started out in the subdued, empty Praça do Giraldo (probably rather deserted as a result of the poor weather), where we had great, uninterrupted views of the Church of St. Anton and a Renaissance fountain. From the square, we walked through back streets filled with the distinctive Portuguese white and yellow-painted buildings that apparently can also be found in colonial architecture in Brazil. In another city square we stopped at the impressive Roman Temple of Évora, which may have been dedicated to Jupiter, rather than Diana; it is one of the most complete monuments remaining from the city's days as a Roman settlement. The tour also visited a section of the old Roman wall around Évora, as well as Roman baths found beneath the city's Town Hall. I enjoyed learning about the city's extensive history, although I think I will need to revisit Évora during better weather in order to fully appreciate the city. 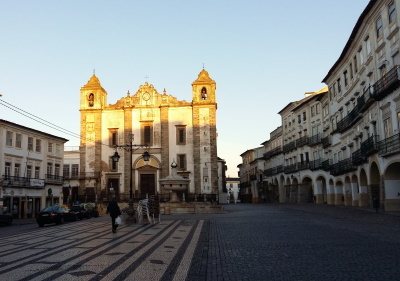 Logistics: Évora is an easy day trip from Lisbon, and can be reached by train, bus, or automobile. The historic center of the city is very walkable. I visited this WHS in August 2014. I spent a night here before heading to Elvas the following day. 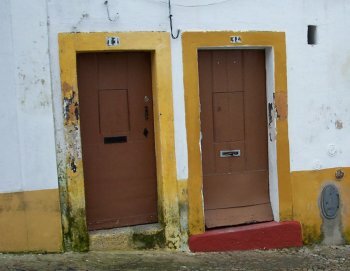 Overall, I felt that Evora was the most neglected WHS in Portugal and the one that mostly needs attention. The white and yellow paint of most buildings has faded or peeling off and having a private parking lot just next to the Temple of Diana which is the main attraction doesn't help either. Having said that I really felt I was almost visiting a WHS in Latin America and not in Europe so the OUV for the architecture that was exported to mainly Brazil is definitely there. Having practically no entrance fees to pay, I decided to visit the bone chapel near the Church of St Francis. Unfortunately prices have tripled and I had to pay 2 euros as an entrance fee and 1 euro to be able to take photos. I'm happy I visited the bone chapel but I still think that 3 euros is too much. I agree with David that there is much of value to see here, and with Ann regarding the magnificent aqueduct. But the experience for me was marred by the traffic and huge car parks that obstruct views of the sites. These should be removed well away from the city walls. 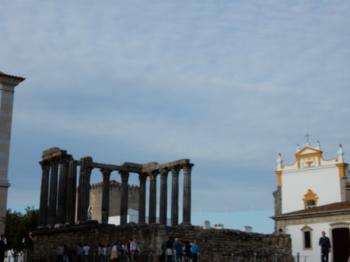 I do not understand how I can see such bad comments and opinions about the capital of Alentejo. Ebora Cerealis (roman name), is one of most amazing and monumental cities on the Iberian Peninsula. It was considered the ideal exemple of a "museum-city". I've known the city since I was litle, and it has always fascinated. My favourite places are: the Catedral and it's museum (Tesouro da Sé - Museu de Arte Sacra), the Giraldo square with the St. Antão church, the city museum, the Diana roman temple, the Loios church and convent, the St. Francisco church with the Bones chapel (capela dos Ossos) and the Graça church. Like a typical and yet sumptuous city of the south of Europe, Évora has a charm and elegance hard to find in anywere on the world. outside walls so you could see the progress. And for you shoppers out there, there is some great shopping to be had here of local craft and products from around the area. It is a good base location, and we made several day trips. What was a disappointment though was the "megalithic tour". The standing stones and "painted" caves are less than impressive, especially if you've visited Stonehenge, or seen any of the desert rock paintings in Arizona, USA or elsewhere. interesting town we visited was Estremoz, especially on market day. So if in Portugal, include Evora on your schedule. Do the research and you'll enjoy it.